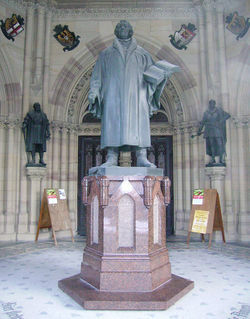 Martin Luther statue in Speyer, the city where the Diet of Speyer occurred. Protestantism encompasses the forms of Christian faith and practice that originated with the doctrines of the Reformation. The term is derived from the Protestatio delivered by a minority of delegates against the (1529) Diet of Speyer, which passed legislation opposed by the Lutherans. Since that time, the term has been used in many different senses, but not as the official title of any church until it was assumed in 1783 by the Protestant Episcopal Church in the United States, the American branch of the Anglican Communion. Most broadly, Protestantism is Western Christianity that is not subject to papal authority. This principle implies in the rejection of the primacy of the Bishop of Rome. The Eastern Orthodox Church concedes the primacy of the Bishop of Rome to be merely one of greater honour, treating him as "primus inter pares" ("first among equals"). The protestants argued that Matthew 16:18-19 does not support the authority given to Peter and that the keys were given not to Peter alone but to the whole church. This principle is represented by the slogan Latin: Solus Christus that means "Christ alone". Some fundamental doctrines of the Catholic Church are rejected by the protestants like Transubstantiation, Purgatory, veneration and prayer to saints (slogan Latin: Soli Deo Gloria meaning "Glory to God Alone") among others. The universal priesthood of believers entails the right and obligation of the lay Christians not only of reading the Bible in the vernacular, but also to participate in government and public affairs of the Church. All Christians, by virtue of their baptism, are priests and access to God is not controlled by a hierarchical priesthood. The doctrine that the Bible contains all knowledge necessary for salvation and holiness is known as Latin: Sola scriptura and means "by scripture alone". Sola Scriptura is the principle that the Bible takes precedence before the tradition bequeathed by the magisterium of the Church, when the doctrinal principles between them are conflicting. Only those doctrines found directly within or indirectly by using valid logical deduction or valid deductive reasoning from scripture are to be admitted or confessed by the members of the protestant churches. The belief in justification by faith alone. The principle that salvation comes by free grace through faith alone in Jesus as the Christ, rather than through good works. This principle is known as Latin: Sola fide and means "by faith alone". A slogan related to this principle is Latin: Sola Gratia, which means "Grace Alone". Luther (1483-1546) was a German Augustinian monk, Catholic priest, and theology professor who was the initiator of the Protestant Reformation. In 1517, Johann Tetzel began to sell indulgences near Wittenburg, Germany to raise money for building St. Peter's Church in Rome and to pay the personal debts of Prince Albert of Brandenburg. The buying of these indulgences was claimed to be sufficient to get a person out of purgatory. In response, Luther wrote the "95 Theses", or 95 objections to Roman Catholic teaching. Luther was plagued by thoughts that he was not righteous enough to earn salvation. However, while reading the Epistles of St. Paul, he realized that justification came from God’s grace alone and was received by faith. 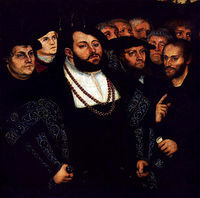 After being excommunicated from the Roman Catholic church in 1521, Luther translated the New Testament from Greek to German and became the leader of a new church. Zwingli (1484-1531) belonged to the first generation of reformers. His father was a farmer and the chief magistrate of Wildhaus. Zwingli first raised the matter of the Reformation when he held that tithing by the faithful was not of divine authority and that it was a voluntary matter. Guillaume Farel, Johannes Calvin, Théodore de Bèze, John Knox represented on the Reformation Wall in Geneva, Switzerland. Calvin (1509-1564) was a French-Swiss theologian. His writings, including Institutes of the Christian Religion (1536) have had a great influence on Protestant theology. His ideas influenced John Knox, who led the Scottish reformation. In 1541, Calvin set up a government in Geneva, Switzerland, led by presbyters. ↑ Latourette, Kenneth Scott (1997). A History of Christianity:Reformation to the Present. 2. Peabody, MA: Prince Press. p. 727. ISBN 1-56563-329-6. ↑ González, Justo L (2010). The Story of Christianity: The Reformation to the Present Day. II. New York: HarperCollins Publishers. p. 52-53. ISBN 978-0-06-185589-4. ↑ Mosse, George L. "Luther, Martin". In The World Book Encyclopedia. Chicago, IL: Field Enterprises Educational Corporation. 1963. ↑ Luther, Martin. Thesis 27. 95 Theses. 1517. ↑ Cairns, Earle E (1996). Christianity Through the Centuries: A History of the Christian Church (3rd, revised and expanded ed.). Grand Rapids, Michigan: Zondervan Publishing House. p. 294. ISBN 0-310-20812-2. ↑ 6.0 6.1 6.2 Mosse, George L. "Calvin, John". In The World Book Encyclopedia. Chicago, IL: Field Enterprises Educational Corporation. 1963. This page was last modified on 25 September 2017, at 23:37.